Yeah, figures. I said something last week about this month’s Diva Challenges being easy on me since they seem to be in line with the Inktober Tangle Prompts. So of course, things are different this week. This week Laura challenges us to use our non-dominant hand to tangle. For me, that is my left hand. I drew this week’s tangle with with my left hand but shaded with my right hand, so it was a bit easier. Yeah, very squiggly lines. But I did it. It definitely looks muddy. Possibly a bit like popcorn and homey. Here are my other drawings from the last week. I used a bit of orange watercolor pencil after I’d shaded with the graphite. I auraed Hamadox, so it kind of resembled a drain. 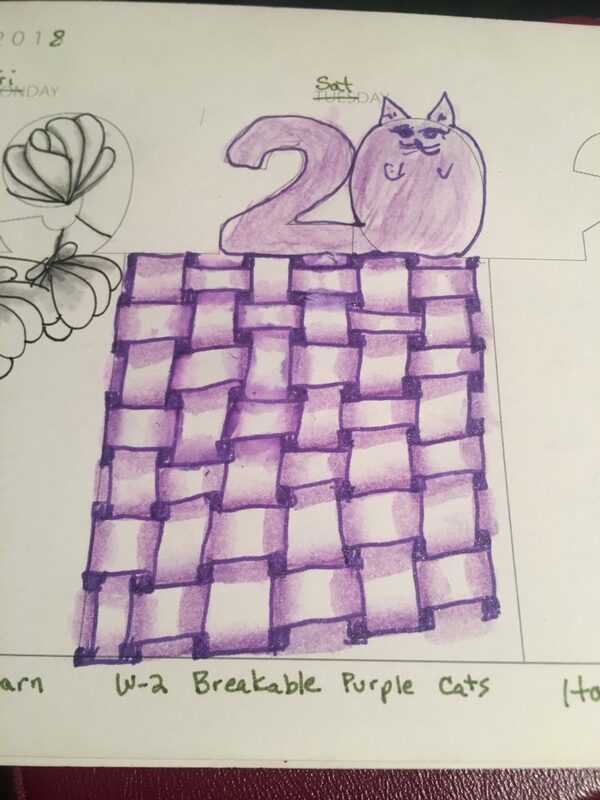 I used my pruple glitter pen for the main drawing. Then I tried to use the distress ink marker but it didn’t turn out very good, so I attempted the watercolor pencil and I liked it. 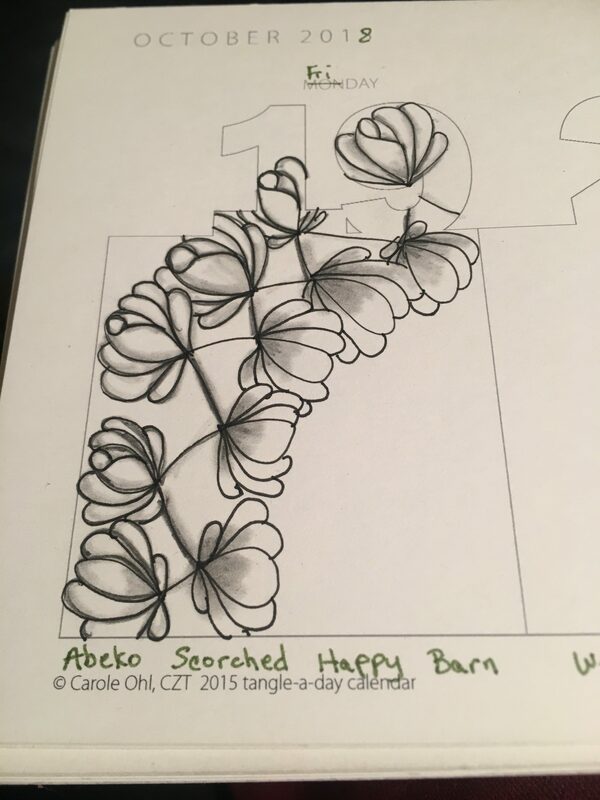 This is one of my new favorite tangles: Abeko. It flows so well and I love the look. Of course, I drew it a bit larger than how it is in the stepouts but I like it all the same. My “girl” on the left is a bit of an old girl. I didn’t quite get Luv-a the way I’d like to. However I do like my bottle. Even after watching two different videos on how to draw Narwal, I will need a lot more practice to make it something I like. Oh, and my pears look more like gourds. This is one of my favorites, in spite of not really drawing Joki according to the stepouts. I liked the lacing though. The family liked the squirrel. And with that, I’m all caught up. I have been posting the inktober drawings on instagram most days, if you’re interested. Laura is being rather easy on me with these diva challenges so far this month, for which I am grateful. As I mentioned last week, I too am participating in Inktober, although I’m not working in many of their prompts but I’m okay with this. Basically I’m following Stephanie’s tangle prompts, as is Laura. 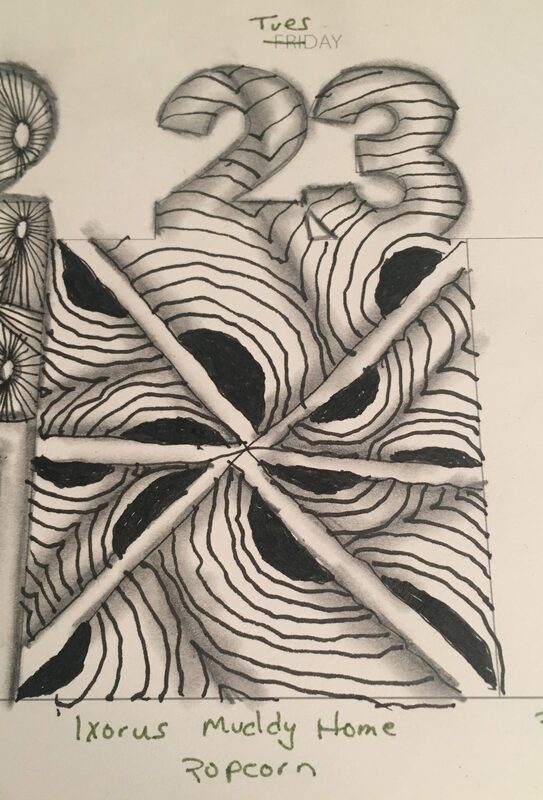 That is the one thing that I seem to be getting done in each day’s drawing. Some days I get the Pattern-Collections prompt in as well. The same goes for the doodlewash prompts. 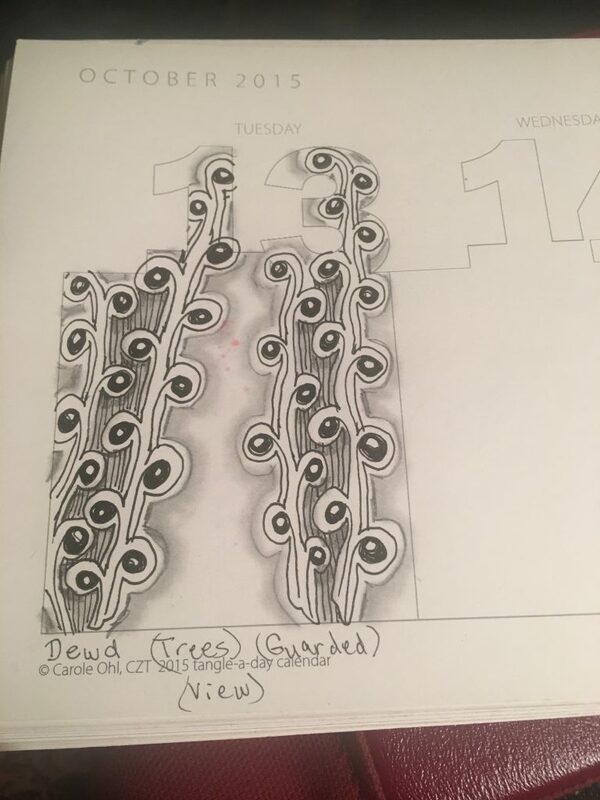 It’s been nice to actually fill in the spaces on my Tangle-a-day calendar that I got several years ago and just did not follow through with. I didn’t get pictures of the entire page before it got dark last night, so I’ll have to settle for these individual pictures I posted on Instagram. On the 9th the tangle prompt was Fe-Ba which I had never done before and I must add that I did not do it correctly. I should have skipped every other diagonal. Oh well! 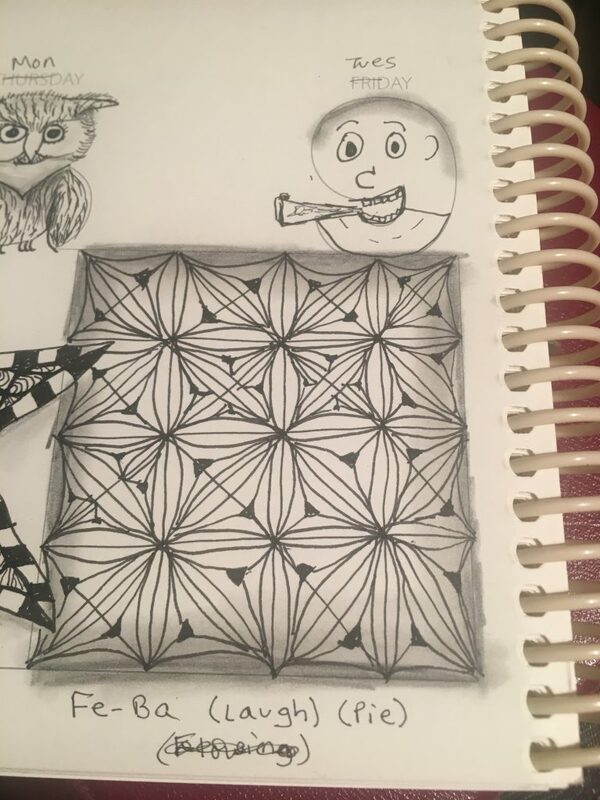 The pattern-collections (p-c) prompt was laugh and the doodlewash prompt was pie. The inktober prompt was precious and unless you just call this finished thing precious I don’t think that one worked into it. Since it was the 9th, I used that for my laughing face and then attempted to draw a slice of pie headed into its mouth. 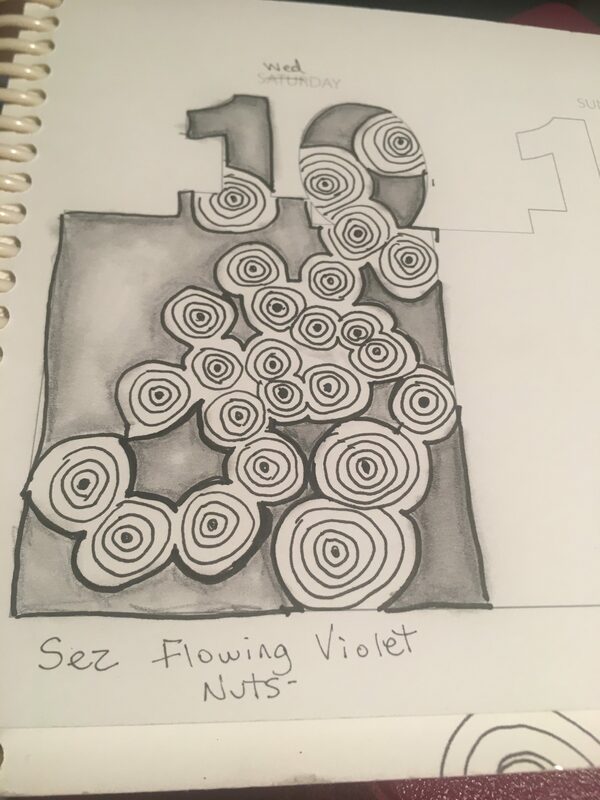 On the 10th the tangle was Sez, inktober prompt was flowing, p-c was violet, and doodlewash was nuts. I figure the sez tangle could kind of look like nuts and they were all flowing into one another. If I’d have thought a bit more about it, I’d have used a purple pen but alas, I didn’t. 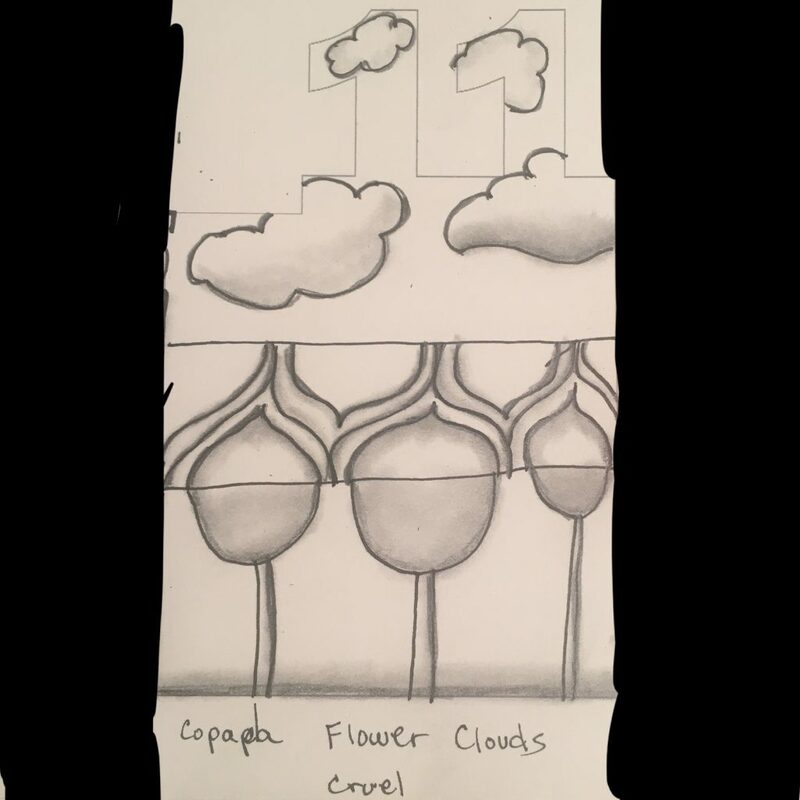 On the 11th the tangle was Copada, with cruel, flower, and clouds. Well, once again the Inktober prompt of cruel doesn’t seem to make it into my inking but I think the others make an appearing. 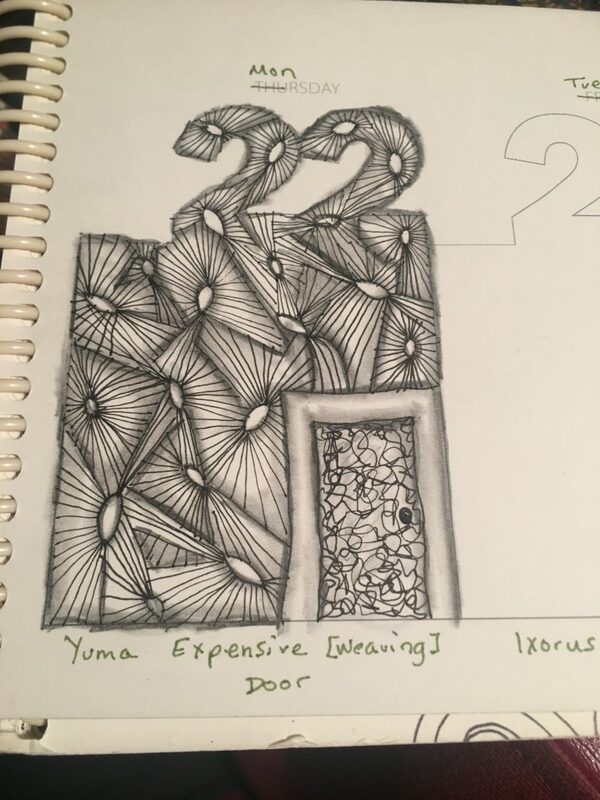 I like including the number into my tangling when possible. I think the 12th is one of my favorites so far. The tangle was Heartswell, with prompts of whale, red, and spices. This time it was the doodlewash prompt that didn’t make it. For the p-c prompt red I decided to use a red watercolor pencil after inking it. That did not turn out very red, so I got out my distress ink marker in candy apple red and love how the left side of heartswell turned out. Now we come to the 13th, which is Dewd and the Diva Challenge for the week. The prompts were guarded, view, and trees. I guess this could be interpreted as any one of them. Dewd and I are not the best of friends yet but I do like how I worked it up into the numbers. 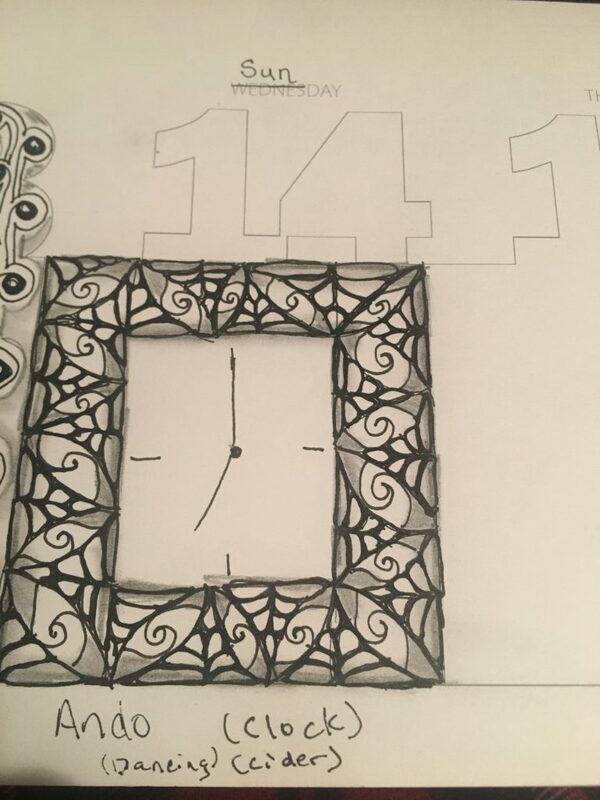 Sunday the 14th’s tangle was Ando with clock, dancing, and cider. Inktober prompt of clock was easy to work into my tangling since I chose to draw ando in a frame. 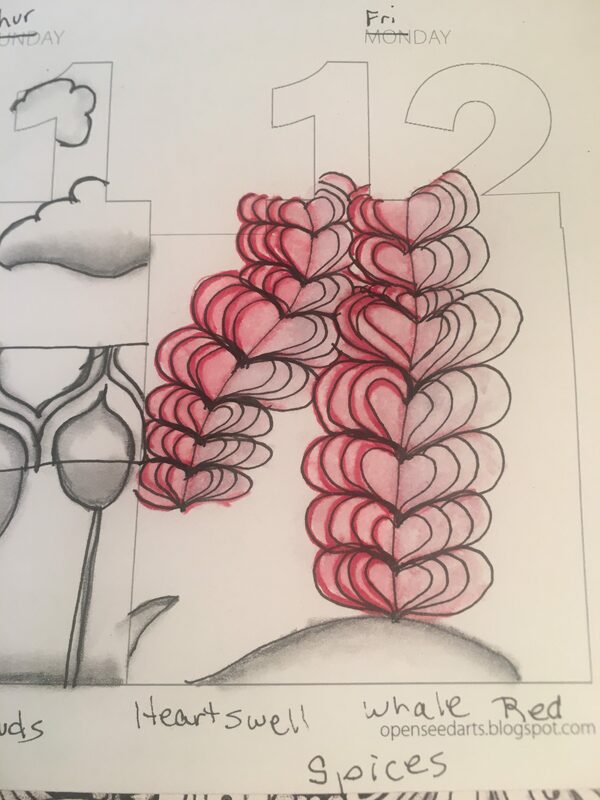 On the 14th the tangle was Inapod with weak, Hope, and Hay as the prompts. I ended up just tangling inapod, which is quite alright. When I shared this one on instagram I accidentally labelled it as joki because I was putting up the next one at the same time. I’ll share Joki’s inking next time. I think that’s enough for today. Have a great week. We shall, as we will be celebrating birthdays this weekend so I get to see my married son, daughter-in-love, and GRANDSON. I decided to participate in Inktober this year. 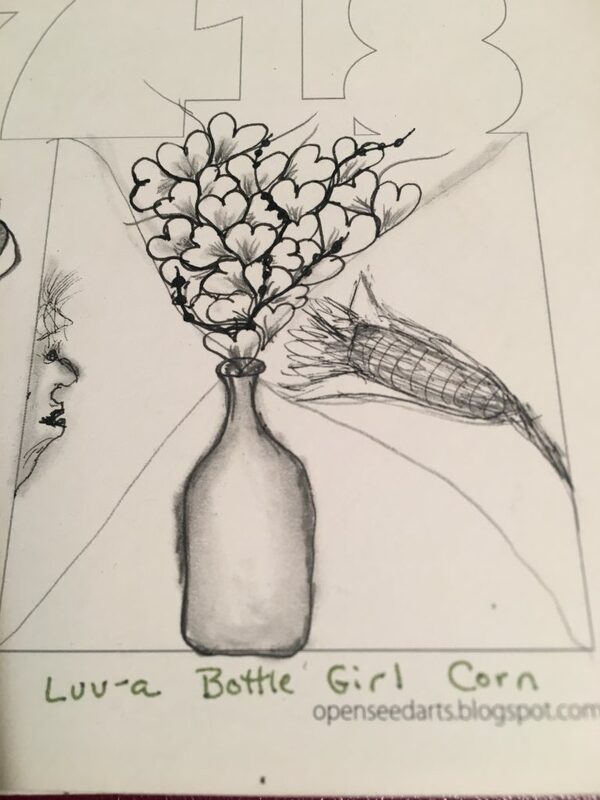 I hadn’t really heard of Inktober except once one year near the end of October when Laura Harms of the Diva Challenge mentioned it but had promptly forgotten about it. 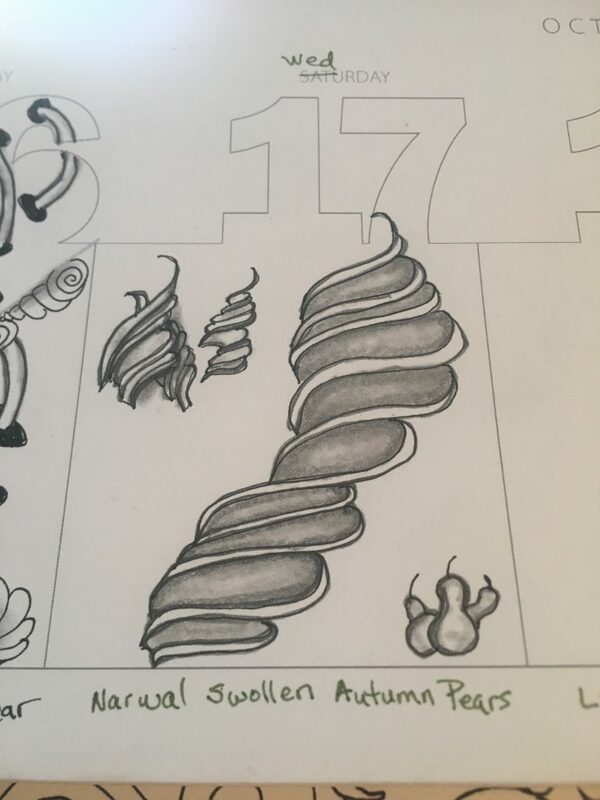 Then this year Nicole of Pattern-Collections posted some prompts for Inktober. 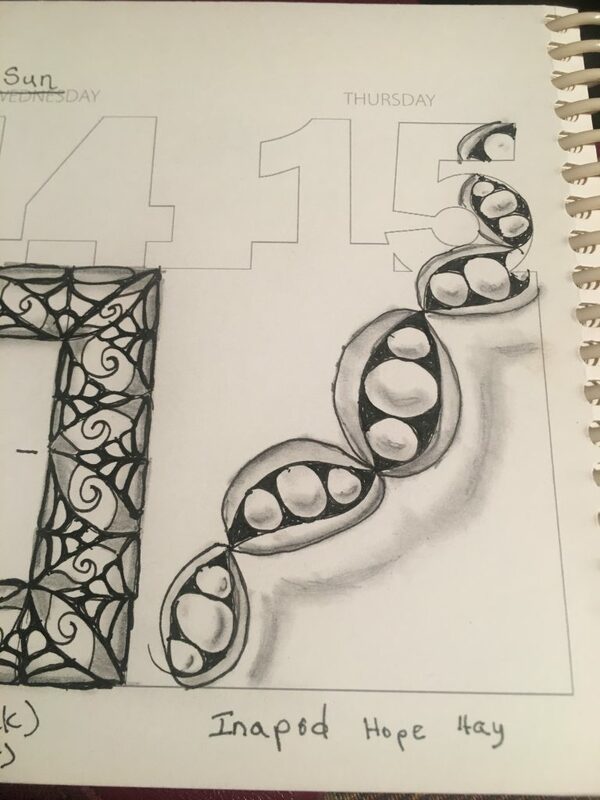 They didn’t include any specific tangles because they already have a daily pattern suggestion. That got me to wondering what other prompts their were. I searched Inktober and found their prompts here. I also found Doodlewash had some prompts too. I’d actually never heard of doodlewash either. Looks like they may have a monthly prompt. 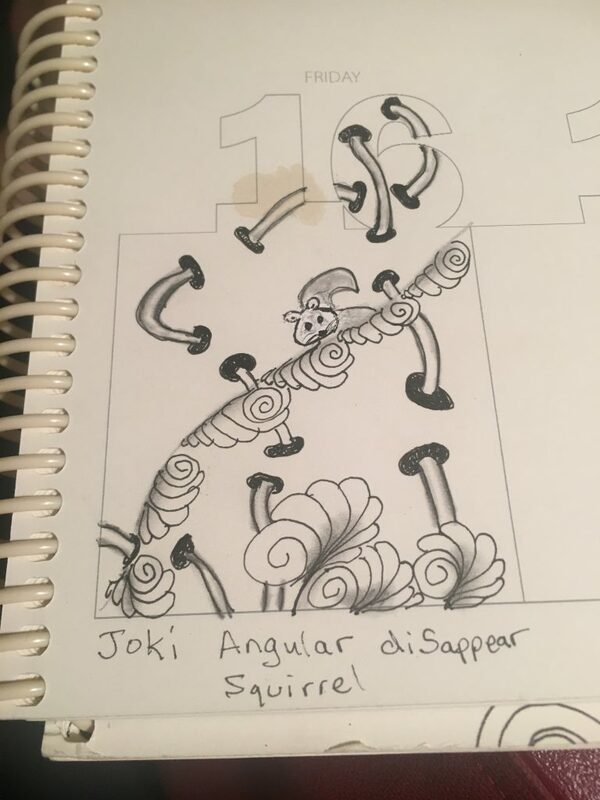 Then I did one more search for tangle suggestions for Inktober and found this. Apparently Stephanie does prompts yearly for Inktober and was probably the one Laura was following the first time I heard about it. So . . . I’ve been combining these things as best I can. I don’t stress over it but just think about it a little bit to see if I can work it together. Then I include the prompts that work easily and don’t stress the others. I am posting my pieces daily on Instagram. However, I thought I’d include them here today. 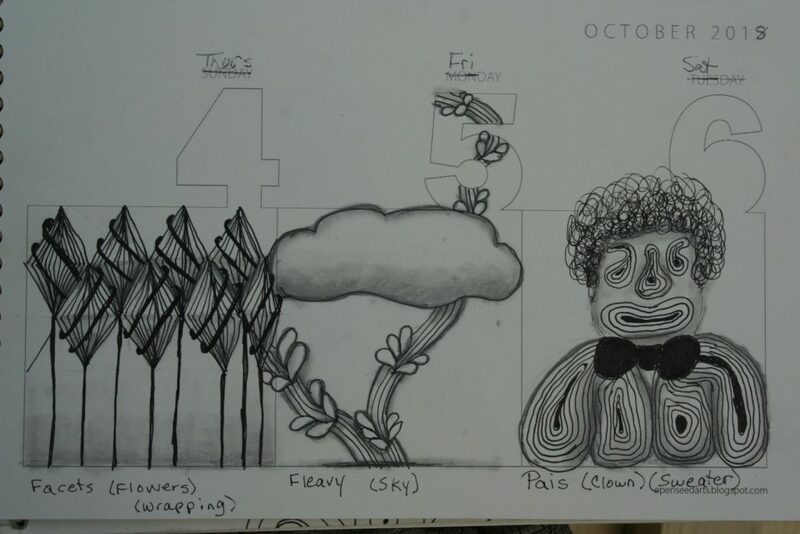 I have two tangle-a-day calendars that I never used completely (or even mostly). I found that I do have one that had the entire month of October empty, so that’s where I’m tangling. On the first I used all but the Inktober prompt of poisonous unless you think Snow White and then I guess I nailed it. On the second I only managed to use the tangle Yah and the doodlewash prompt of leaves. I’m not thrilled with how either of these turned out but at least I got started. 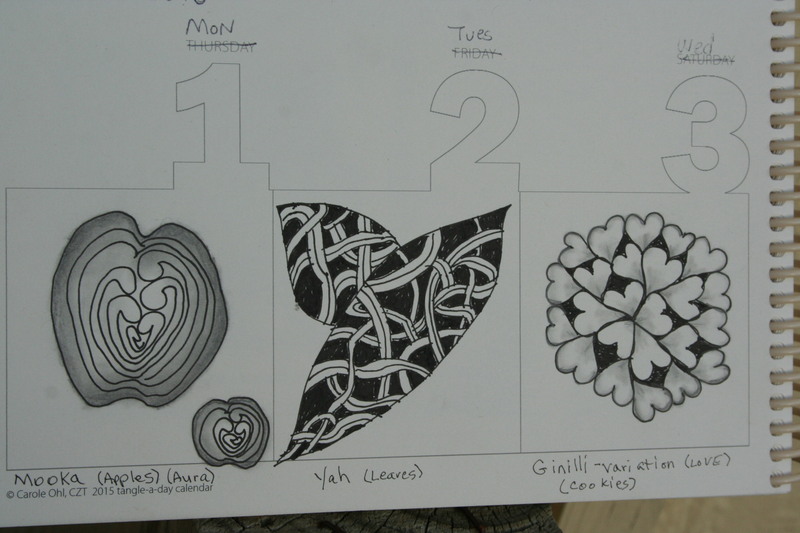 On the third I made a heart variation of Ginilli for the Pattern-Collections (p-c) prompt of love and then put it in a round shape for a cookie like presentation or like a bunch of heart shaped cookies were on a platter. 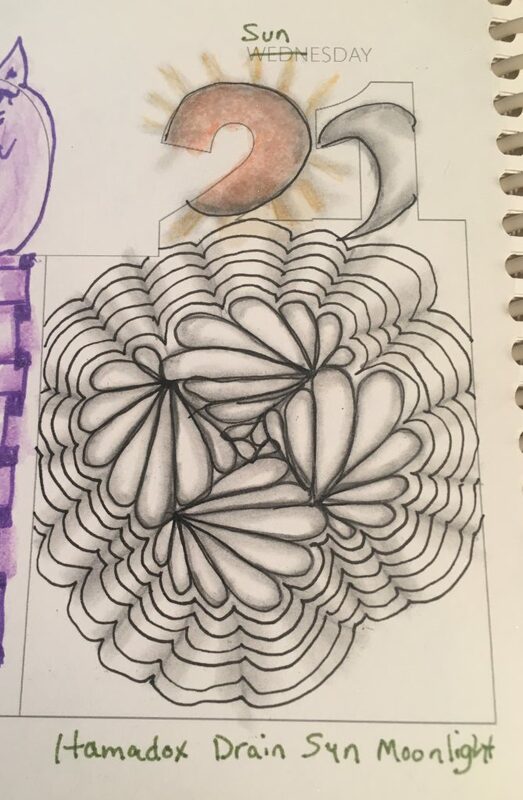 On the fourth, the tangle was Facets and the doodlewash prompt was flowers. So I decided to do just two rows of facets and make “stems” on them for flowers. Then I added some “wrapping” on the facets and I like how it turned out. It’s probably my favorite one so far although the one on the fifth is nice too. I really didn’t do Fleavy justice on the fifth, but thought it made a nice vine going up into the sky for the p-c prompt. I thought about drawing a cup at the bottom and make it like Fleavy was steam coming out of the cup but . . .
On the sixth Pais was the tangle with clown for p-c and sweaters was the doodlewash prompt. So, I butchered Pais and used it over and over again for the facial features and sweater parts. Then I added a bowtie and some hair. So far, you may notice that I haven’t included the Inktober prompts yet. 😯 They are pretty hard to include in tangled pieces, at least for me. They include poisonous, tranquil, roasted, spell, chicken, drooling, and exhausted through the seventh. Then there was the seventh. Onion drops was the tangle that I included like clouds FLYING above the ground. Yeah, flying was the p-c prompt with berries as the doodlewash prompt. I used some fescue and some bronx cheer to round out that one. Yeah, not my best work and the poor tangles were poorly represented. I’m pretty happy with the eighth’s offering. 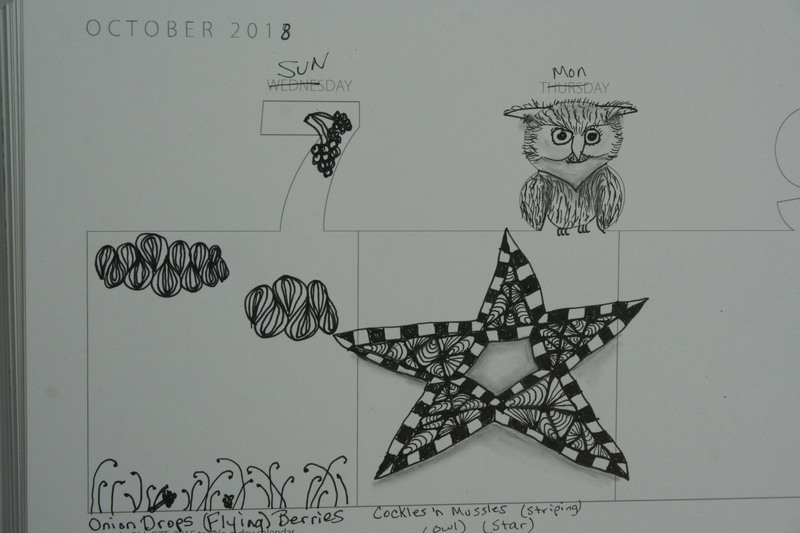 I managed to include all four prompts: Owl, Star, striping, and the tangle cockles ‘n mussels. If you want to see more, you can find me on Instagram where I am lifeofjoy.me.